The Bucks (8-6), who shot 48.7 percent, have now won four straight. Middleton, who played a team-high 40 minutes, shot 12 of 21 from the floor and had eight assists and six rebounds in the win, while Antetokounmpo finished with six rebounds, four blocks and three steals. “I’m just playing hard,” Middleton said. “That’s what I’ve noticed over the first couple of games. I don’t think I was playing hard enough. “I’ve talked to some coaches, teammates, KG (Kevin Garnett) also came in, and the common thing that most of the guys were saying was I just need to play harder. Eric Bledsoe, the team’s recently acquired, had 14 points, eight assists, six rebounds, three steals and two blocks, Tony Snell scored 12 points, while Malcolm Brogdon ended with 12 off the bench and John Henson had 10 points and 10 rebounds for Milwaukee. Avery Bradley led the Pistons (10-4) with 28 points and five assists and Andre Drummond had 13 points and 17 rebounds for Detroit. Tobias Harris scored 13 points and Luke Kennard finished with 11 off the bench in the defeat. Trailing 75-64 entering the fourth quarter, the Pistons rallied to pull within one point at 82-81 when Anthony Tolliver hit a 3-pointer with 5:51 left. The Bucks built the lead back to six points, but Drummond’s free throw locked the scores at 93-93 with less than one minute remaining. 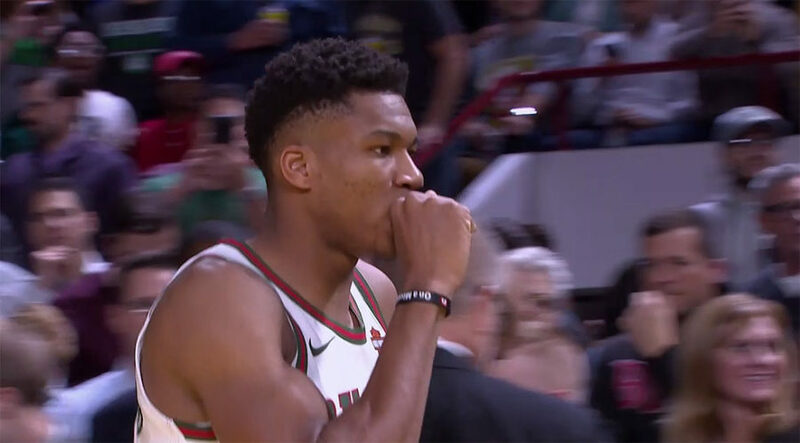 But Bledsoe, who missed his first six shots, scored four straight points, including two key free throws down the stretch and Milwaukee held on for the win. Detroit, which fell to 3-3 away from home, had its five-game winning streak snapped. The Bucks had 10 steals and blocked 16 shots on the night — two shy of the team record set in 1980 against Detroit. “That’s the game right there, absolutely,” Pistons coach Stan Van Gundy said. “That’s 16 opportunities you don’t even get the ball up on the rim.